Louis XVI (French pronunciation: ​[lwi sɛːz]; 23 August 1754 – 21 January 1793), born Louis-Auguste, was the last King of France before the fall of the monarchy during the French Revolution. He was referred to as Citizen Louis Capet during the final four months of his life. In 1765, at the death of his father, Louis, son and heir apparent of Louis XV, Louis-Auguste became the new Dauphin of France. Upon his grandfather's death on 10 May 1774, he assumed the title "King of France and Navarre", which he used until 4 September 1791, when he received the title of "King of the French" until the monarchy was abolished on 21 September 1792. 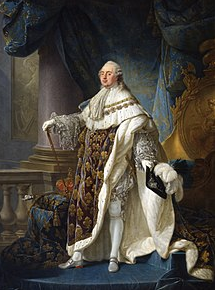 The first part of his reign was marked by attempts to reform France in accordance with Enlightenment ideas. These included efforts to abolish serfdom, remove the taille, and increase tolerance toward non-Catholics. The French nobility reacted to the proposed reforms with hostility, and successfully opposed their implementation. Louis implemented deregulation of the grain market, advocated by his liberal minister Turgot, but it resulted in an increase in bread prices.